Local politicians gathered at Strescon on Tuesday, October 9th to announce the company’s new headquarters. Saint John MP Paul Zed; New Brunswick Supply and Services Minister Roly MacIntyre, MLA for Saint John East and Minister responsible for the Regional Development Corporation; and Saint John Mayor Norm McFarlane, were in attendance at Ashburn Lake Road, to help unveil the sign for the new building, and to pour the first concrete footings for the building. The new offices will face Route 1, with highway access via the soon to be built, East-bound exit ramp announced last August by city and provincial officials. “This whole area is changing” spoke MLA Roly McIntyre. “The Saint John economy is beginning to boom… the new ramp has already begun and will be complete in 6 weeks, by the middle of November.” “We want to particularly thank MLA Roly MacIntyre, Mayor McFarlane, and Premier Graham for their help in building this new ramp” said Strescon Vice Chairman, John Irving. “It just goes to show you how such a small stretch of road can have such a huge impact.” said MP Paul Zed “…Team Saint John is alive and well, working together in the community”. Mayor Norm McFarlane commended Premier Graham for his quick action on the offramp, which was approved “within days”. “Cooperation makes things happen”, smiled McFarlane. The new ramp will connect Route 1 to Ashburn Lake Road and will provide a vital connection from the MacKay Highway to Rothesay Avenue and Retail Drive, where a major retail development is underway. Drivers can already enter eastbound onto Route 1 from Ashburn Lake Road. As an integral part of Strescon’s 5 year modernization program, the 16,300 square foot building will be an impressive showpiece for Strescon’s products and craftsmanship. “We’re very excited about this building” said company President Hans O. Klohn. “It will feature a large variety of our products and will be the first all-precast concrete office building in Atlantic Canada.” “Our modernization includes $8 million of capital expenditures to both construct this building and to continue upgrading our production facilities” Mr. Klohn told the crowd of onlookers. 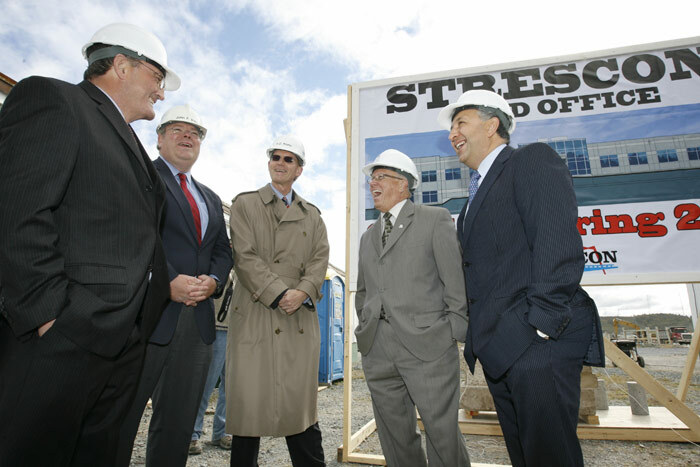 “…none of this would happen without the dedication of our employees, and we’re very grateful to have them.” The state-of-the-art office is scheduled for completion by the spring of 2008, at which time Strescon’s current offices will be converted to new lunchroom, washroom and locker room facilities for Strescon’s production personnel. Architects for the project are Architecture 2000 Inc. of Moncton, with Toss Solutions of Saint John handling the interior design details. FCC Construction is providing the Project Management services, as well as the electrical and data work for this project, while Ocean Steel will provide reinforcing steel. Strescon will, of course, provide all concrete products for their new home. Strescon has developed and produced architectural, structural and environmental concrete products since 1963. They have grown to become the largest precast, prestressed concrete manufacturer in Eastern Canada and with sales offices in New Brunswick, Nova Scotia, PEI, Maine and Massachusetts service customers throughout Atlantic Canada and the New England states.